Diamond Om Pendant made in 14k Yellow Gold (0.43ct) See Specifications for more details. SHIPPING DE..
Diamond Pendant made in 14k White Gold (.90 cts) See Specifications for more details. SHIPPING DETAILS ..
Diamond Pendant made in 14k White Gold (0.05ct) See Specifications for more details. SHIPPING DETAILS ..
Diamond Pendant made in 14k White Gold (0.45ct) See Specifications for more details. SHIPPING DETAILS ..
Diamond Pendant made in 14k White Gold (0.48ct) See Specifications for more details. SHIPPING DETAILS ..
Diamond Pendant made in 14k White Gold (0.75ct) See Specifications for more details. SHIPPING DETAILS ..
Diamond Pendant made in 14k White Gold (0.78ct) See Specifications for more details. SHI..
Diamond Pendant made in 14k White Gold (1.27cts) See Specifications for more details. SHIPPING DETAILS ..
Diamond Pendant made in 14k White Gold (1.50cts) See Specifications for more details. SHIPPING DETAILS ..
Diamond Pendant made in 14k White Gold (1.61cts) See Specifications for more details. SHIPPING DETAILS ..
Diamond Pendant made Set in 14k White Gold (0.21ct) See Specifications for more details. 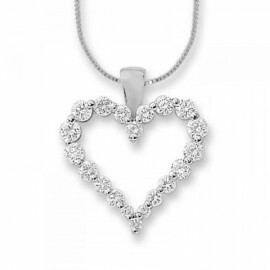 SHIPPING DETAILS&..
Diamond Pendant made in 14k White Gold (0.25ct ) See Specifications for more details. SHIPPING DETAILS &nbs..
Diamond Pendant made in 14k White Gold (0.25ct) See Specifications for more details. SHIPPING DETAILS ..
Diamond Pendant made in 14k White Gold (0.2 ct) See Specifications for more details. SHIPPING DETAILS ..
Diamond Pendant made in 14k White Gold (1.02ct) See Specifications for more details. SHIPPING DETAILS ..
Diamond Pendant made in 14k White Gold (1.42cts) See Specifications for more details. SHIPPING DETAILS ..
Diamond Pendant made Set in 14k White Gold (0.25ct) See Specifications for more details. SHIPPING DETAILS&n..
Diamond Pendant made Set in 14k White Gold (1.27ct) See Specifications for more details. SHIPPING DETA..
Diamond Pendant Set in 14k White Gold (0.12ct ) See Specifications for more details. SHIPPING DETAILS &..
Diamond Pendant Set in 14k White Gold (0.2ct ) See Specifications for more details. SHIPPING DETAILS ..
Diamond Pendant Set in 14k White Gold (0.35ct ) See Specifications for more details. SHIPPING DETAILS &nbs..
Diamond Pendant Set in 14k White Gold (0.4ct ) See Specifications for more details. SHIPPING DETAILS ..
Diamond Pendant Set in 14k White Gold (0.6ct ) See Specifications for more details. SHIPPING DETAILS .. Mothers Custom Engraved necklace made in 14k Gold See Specifications for more details. SHIPPING DETAILS Delivery Type: Door.. Mothers Diamond Necklace made in 14k Gold See Specifications for more details. SHIPPING DETAILS Delivery Type: Doorstep&nbs.. Mothers Necklace in 14k Gold See Specifications for more details. SHIPPING DETAILS Delivery Type: Doorstep Deliv.. Mothers Opal and Diamond Pendant in 14k Gold See Specifications for more details. SHIPPING DETAILS Delivery Type: Doors*tep..
Mum necklace with Amethyst and Citine made in 14k Gold See Specifications for more details. SHIPPING DETAILS Delivery Type:..
Mum necklace with Natural Ruby made in 14k GoldSee Specifications for more details. SHIPPING DETAILS Delivery Type: Doorstep&nbs..